BECKHOFF Automation presents the CX90xx and CX50xx device series designed to fulfil all requirements of the worldwide BACnet standard ISO 16484-5:2010. Offering scalable control platforms for the system-spanning automation of buildings, Beckhoff has also implemented numerous additional functions that extend beyond the requirements for BACnet building controllers. Thanks to the integration of the BACnet protocol in the TwinCAT System Manager, it is possible to efficiently configure the I/O Bus Terminals and the BACnet devices with a single tool. In TwinCAT BACnet/IP, Beckhoff offers a complete building automation-capable product line that is characterised by high scalability, from the compact ARM-based CX90xx controller, which supports up to a thousand data points to the CX5020, on which several thousand data points can be centrally collected and processed. These powerful devices can be used without restriction as BACnet Building Controllers (BBC). The DIN rail-mountable embedded PCs from the CX-series integrate an interface for the direct serial connection of the Bus Terminals. The multitude of signal types in the Bus Terminals system, from the digital and analogue inputs and outputs to the interfaces for the integration of subsystems such as EIB/KNX, DALI, MP-bus, LON, Enocean, M-bus, DMX and Modbus, facilitates the realisation of all building automation requirements. 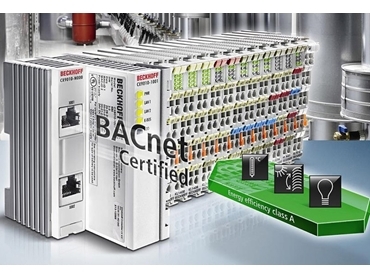 The Beckhoff TwinCAT BACnet/IP product line received BACnet certification earlier this year, corresponding to the worldwide ISO 16484-5:2010 standard. The CX9001, CX9010, CX5010 and CX5020 embedded devices fulfil the conformity requirements for the BACnet standard. Convenient and efficient configuration of BACnet objects, BACnet Servers and Clients can be created with their BACnet objects in a structured manner using the Beckhoff TwinCAT System Manager. BACnet properties can be parameterized and conveniently linked with the PLC as process data. A powerful hardware connection is available to the TwinCAT BACnet/IP controllers in the extensive range of Beckhoff Bus Terminals with over 400 different signal types. The monitoring of the hardware status has been integrated into the BACnet/IP implementation and is available to BACnet/IP applications without additional expense. Extensive additional functions supplement the required interoperability function blocks of the Beckhoff BBC devices. In addition to the global use of TwinCAT BACnet/IP by support for the Unicode character set UTF8, functions also cover the dynamic creation of BACnet objects, whereby timing diagrams and trend objects can be subsequently created and configured. Distributed clocks can be synchronised with the aid of the supported Client and Master functions. BBMD (BACnet Broadcast Management Device) services have been integrated into TwinCAT BACnet/IP for use in widely distributed networks. The integration of spatially remote and third-party devices is particularly convenient within the framework of the Client functionality. BACnet networks can be scanned, and the properties can be parameterized and made available to PLC programs as process data. The property data of the BACnet Clients can be efficiently updated by signalling the changes of state (COV). Thanks to support for the EDE format (Engineering Data Exchange), Beckhoff controllers also work in connection with BACnet devices from other manufacturers.